This page Toulouse-Lautrec Wearing Jane Avril's Feathered Hat and Boa is part of the queer series. Toulouse-Lautrec wearing Jane Avril's Feathered Hat and Boa (ca. 1892) is the informal title to a photo by French photographer Maurice Guibert (1856 - 1913). It depicts French artist Henri de Toulouse-Lautrec (1864 – 1901) wearing Jane Avril's feathered hat, cloak and feather boa. The photo is housed in the Musée Toulouse-Lautrec. 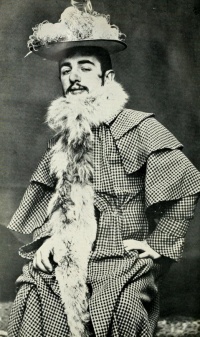 On March 19, 1892 Toulouse-Lautrec, dressed in Jane Avril’s clothes to attend the 'Women's ball' (bal des femmes) held by the Courrier français at the Élysée Montmartre. Here is a version of that photo in the book La vie de Toulouse Lautrec (1958) by Henri Perruchot. Unless indicated otherwise, the text in this article is either based on Wikipedia article "Toulouse-Lautrec Wearing Jane Avril's Feathered Hat and Boa" or another language Wikipedia page thereof used under the terms of the GNU Free Documentation License; or on original research by Jahsonic and friends. See Art and Popular Culture's copyright notice. This page was last modified 20:45, 5 February 2015.